A 300-pound gorilla picks up a toddler and carries her as if she's one of its own in a 22-year-old video that is only now being seen by the masses. The gorilla belongs to Damian Aspinall, who heads a foundation dedicated to conservation and sending gorillas back into the wild. The little girl in the video is Aspinall's daughter, Tansy. 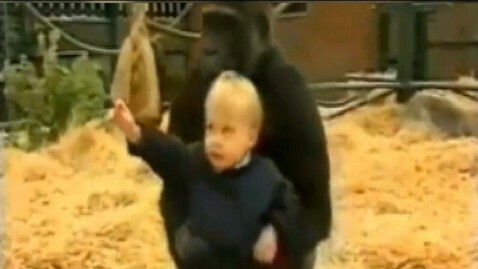 The blonde-haired toddler has a smile on her face as she pets, plays and is carried around by a gorilla. Aspinall said he is releasing the video now to bring awareness to endangered gorillas and to show their gentle nature.